2017 marks the worst year in history for California wildfires. In October of 2017, 8,400 homes burned in Northern California and 7,500 buildings were destroyed. Then in December, extreme Santa Ana winds and dry temperatures sparked more fires, this time in Southern California. 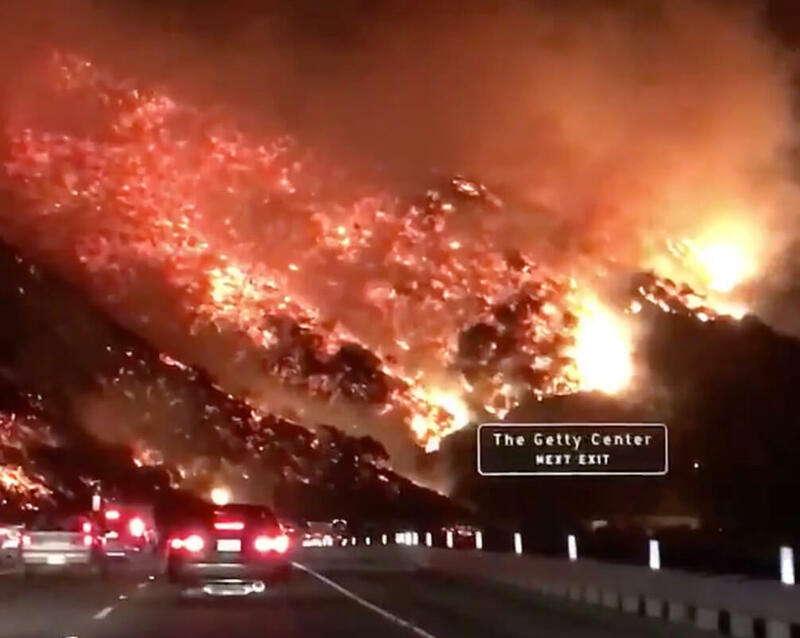 Residents evacuated, grabbing what they could as the Thomas Fire ripped through Ventura County and the Skirball Fire threatened the prestigious neighborhood of Bel Air and the Getty Center. Many celebrities live in both areas. Here’s the list of stars who were affected by the terrifying wildfires. Although Caitlyn Jenner’s $3.5 million home isn’t in the direct path of the fires that have destroyed many homes, it is right in the path of the 60 mile-per-hour winds that have been whipping through Ventura County. Jenner went out for a casual dinner amidst the chaos and when she returned, she found that the roof of her home had blown off. Part of the roof landed in the pool while large chunks of it were scattered throughout her property. What’s worse, however, is when she entered her home to assess the damage, there was no sign of her dog Bertha. Jenner had to spend the night with family and returned to her property the next morning to address the damage. Although she feared Bertha had been crushed under the debris, she was found filthy but safe later in the week. Not even mogul Rupert Murdoch is safe from mother nature. The billionaire’s $30 million property, which houses its own winery, has been threatened by the SoCal fires. Ariana’s brother Frankie was also evacuated in Los Angeles. Everyone in the family thanked the firefighters and said they are praying for all those affected. Amongst the homes destroyed by the Skirball fire was NBA All-Star Andre Kiriklenko’s. Kirilenko and his wife purchased the beautiful contemporary-style just two years ago for $5.55 million. The gated compound boasted five bedrooms, five bathrooms and nearly 4,350 square feet of interior space. A guesthouse, gym, and two detached garages were also located on the athlete’s three-acre property. Kirilenko played in the NBA for 13 seasons between the Utah Jazz, Minnesota Timberwolves, and the Brooklyn Nets. Although he has since retired, he is now the president of the Russian Basketball Federation. After splitting from Arnold Schwarzenegger in 2011, Maria Shriver bought a new home for herself in Los Angeles. Today, she currently lives in Brentwood with her children Katherine and Patrick. The swanky $12 million dollar mansion boasts more than 11,000 square feet, eight bedrooms, seven bathrooms, a three-car garage, a gym, a theatre, and of course, a wine cellar. Although Shriver’s gorgeous digs were spared amidst the devastating fires, that didn’t stop the star from playing it safe. Shrive and her children didn’t evacuate, but kept a close eye on the conditions of the fires and had their bags packed just in case. Chelsea Handler is more than just a comedienne—she’s a political activist. In fact, she left her Netflix show in late 2017 so she could focus on political activism. So it’s no surprise that her tweets regarding the fire mentioned Donald Trump. Handler, who lives in Bel Air, evacuated her home on December 6th. The star purchased the 5,572 square foot mansion back in 2010 for a cool $5.94 million. The home boasts six bedrooms, seven bathrooms, and an enviable pool. Although she evacuated to play it safe, her home was fortunately spared from any damage. Lionel Richie was another celebrity affected by the Los Angeles wildfires. The music legend set to perform at a Las Vegas venue but had to cancel the show in order to help his loved ones evacuate. Richie owns a 17,000 square foot home in Beverly Hills. The $12 million pad overlooks the Los Angeles Country Club and has a majestic quality thanks to its Italian Renaissance design. The interior has ceilings and columns made to look like Italian relics, as well as marble fireplaces and embroidered wall hangings. The musician’s home also has a music studio, sunroom, rose garden, limestone terraces, pool house and swimming pool. It can be hard to remember that celebrities are humans too. We all face hard and scary times, especially when it comes to dealing with natural disasters. Paris Hilton was another celebrity whose home was in danger of being destroyed by the Skirball fire. The socialite and hotel heiress took to Twitter to detail her fear of losing everything as the fire threatened her 7,500 square foot mansion in Beverly Hills. The home, which Hilton shares with her current beau, Chris Zylka, features a massive 120-inch television, as well as its very own nightclub, equipped with a top-of-the-line sound system, DJ booth, smoke machines, and dance pole. Actress and author Lea Michele was another celeb who wasn’t taking any chances. The former Glee star took to Twitter to extend her prayers to everyone affected by the fires and added that she was evacuated to a friend’s home. The star lives in a two-story home in West Los Angeles, which is a far cry from the home she grew up in in the Bronx. The gorgeous mansion has an open floor plan with numerous floor-to-ceiling sliding doors and windows. A lover of interior design, her home is chic and stylish with lots of attention to detail. Fortunately, her abode was spared by the fires. It’s true that mother nature spares no one—even Hollywood A-listers like Jennifer Anniston. During the first week of December, her Bel Air mansion was threatened by the Skirball fire. Anniston shares the $15 million pad with her husband, Justin Theroux. The sprawling property has its own private vineyard couple with an enviable 1,600 square foot wine cellar and a special margarita fountain for mixing her favorite cocktails. A gym, private library, and pool also make the home the perfect sanctuary. Anniston’s home reportedly was spared from the fires and experienced little to no damage. 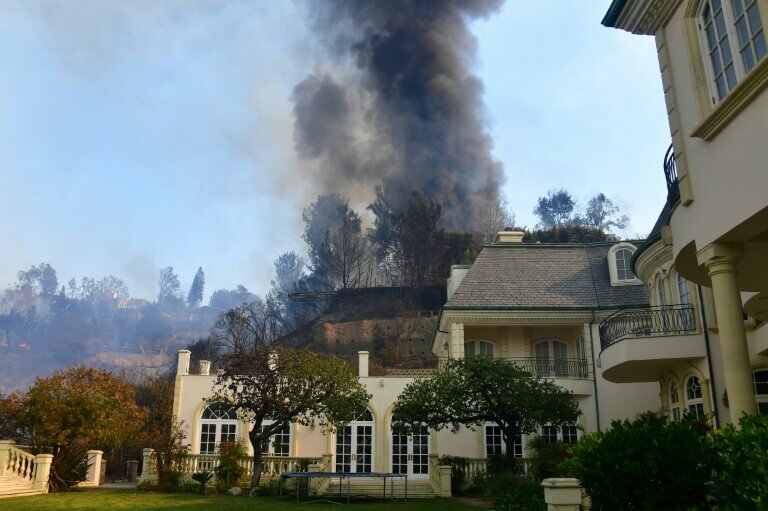 On December 7th Elon Musk’s $17 million home was surrounded by flames in the neighborhood of Bel Air. Firefighters alerted the neighborhood of the mandatory evacuation, but Elon Musk had already left. The fire continued to burn and only got worse overnight. By the next morning, the area was still on fire, and only 30% contained by the following afternoon. 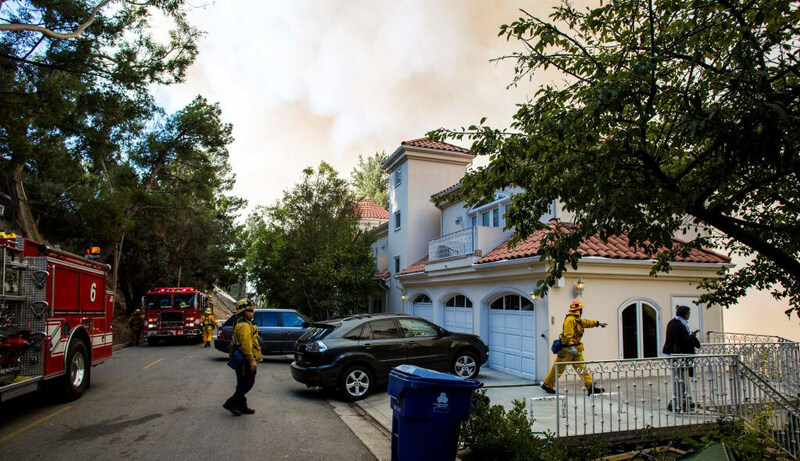 The homes of some of the wealthiest people in the country were under violent threat by the Skirball wildfire, which had leveled 150 buildings and 80,000 acres within a day. Sadly, one person died. The last time a fire spread in the neighborhood of Bel Air was in 1961, which claimed 500 homes. Back then, the homes weren’t as elaborate and valuable as they are now. Beyonce and Jay-Z purchased this Bel Air home in 2017 after the birth of their twins, estimated at $135 million. Their home was one of many in the Bel Air neighborhood that was evacuated. It’s unclear whether the family of five was in the home when the fires broke out, but they must be devastated after only settling into their home a few months before the fires. Reese Witherspoon is no novice when it comes to real estate. She previously owned a home in Bel Air with ex-husband Ryan Phillippe which went on the market. 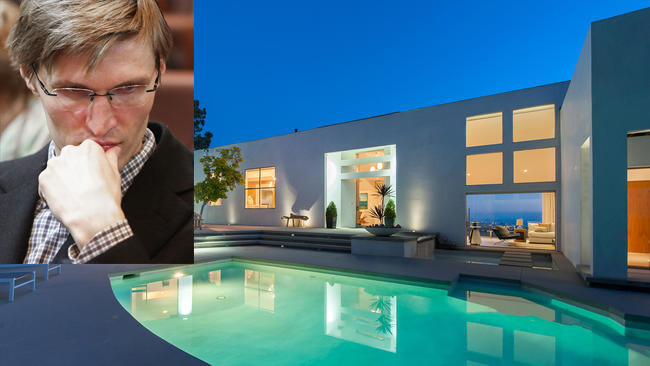 She sold her Ojai Ranch in 2013 for $4.9 million that may or may not be standing. Ojai was another region that was badly burned by the Thomas Fire in Ventura County. The actress now has another home in Bel Air where she currently lives. No word yet on whether it’s safe after the fire ripped through the area on December 7, 2017. Before their divorce, Ben Affleck and Jennifer Garner purchased a gorgeous home together in 2013. 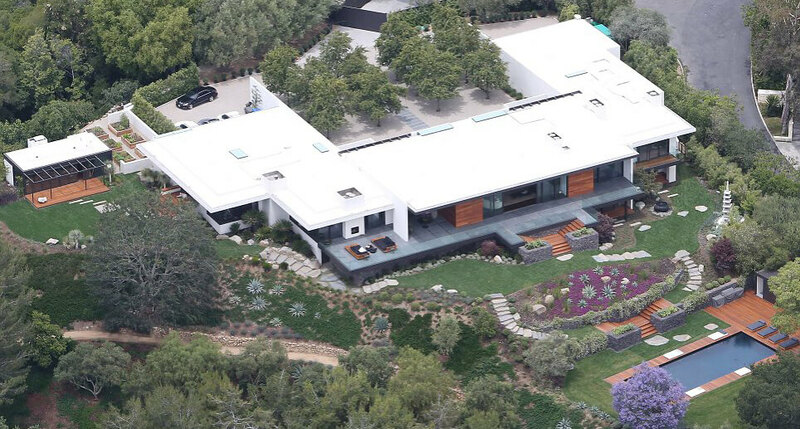 The California ranch house is located in the Pacific Palisades and has been owned by a handful of other celebs. Ben Affleck moved out of the Los Angeles home earlier in 2017, but Garner still lives there with their children. Amidst the SoCal fires in the first week of December, Garner’s neighborhood (pictured above) was evacuated. There has been no word on whether or not the 8,800 square foot, $17.55 million home has sustained any damage. The couple moved into their LA home in 2016, which they bought for $14.1 million and used to be owned by Rhianna. The couple has spent the last year renovating the property to make it their own, so it goes without saying they would be very sad to lose it. 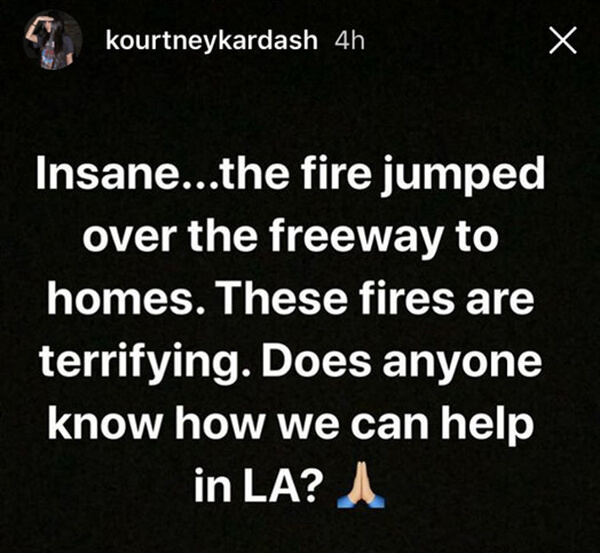 Kourtney Kardashian, who lives in Calabasas with the rest of the Kardashian-Jenner clan was too close for comfort the fires. Positioned on the Los Angeles-Ventura County line, Kourtney’s home was between two fires. Although her home wasn’t in an area of evacuation the wind and weather conditions meant no one could relax. The reality star took to social media seeking answers on how to help victims of the wildfire. Hopefully, the rest of the family remained safe, as Caitlyn Jenner’s roof was ripped from her Malibu Canyon home nearby. 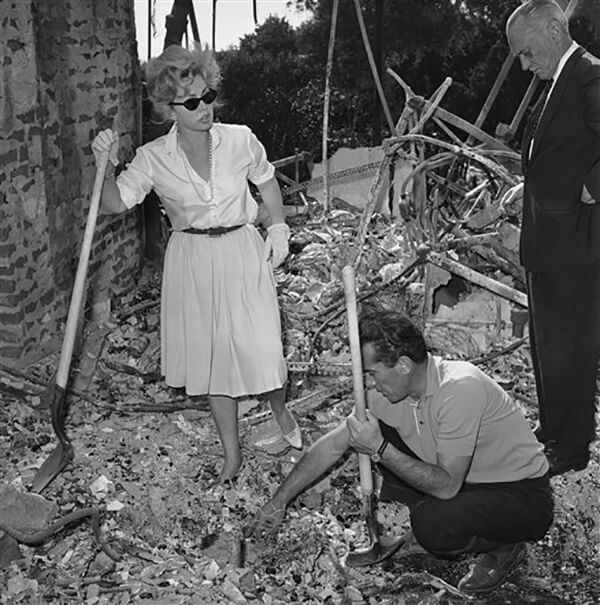 Back in 1961 when elite socialite Zsa Zsa Gabor lived in Bel Air, her home burned down in a fire. 484 homes were destroyed in what started as a brush fire that was similarly fueled by strong Santa Ana winds. 16,090 acres burned in the Bel Air Fire. Here she’s pictured with Robert Straile as they dig through the remnants of her home that she had purchased for $275,000. Zsa Zsa returned to sift through the ashes in order to find a safe of jewelry she hadn’t been able to evacuate. They didn’t find it. 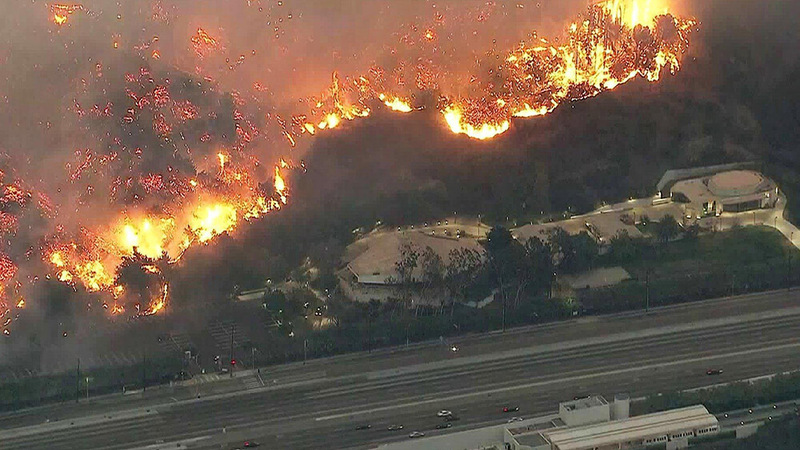 As the SoCal fires inches towards the iconic Getty Museum, fear spread over the thought of losing the museum and all of the important artwork inside. But perhaps, the museum might not be at much risk at all. Located in the wildfire-prone area of Santa Monica, the center uses a variety of architectural and design techniques to mitigate the negative effects of wide fires. 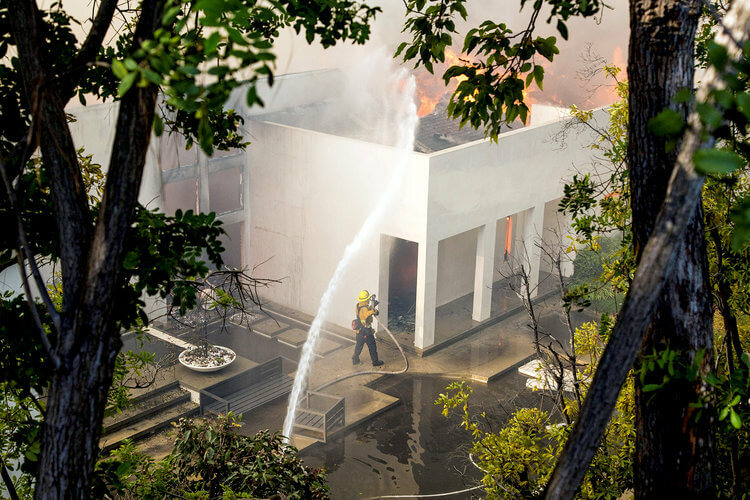 “When the Getty was designed and built 20 years ago, it was designed in such a way to actually protect the collection from disasters, like a fire,” said Ron Hartwig, the Getty’s vice president of communications. Let’s hope the 940,000 square foot complex is safe. The now-infamous video of the 101 highway with flames violently building on both sides depicts the dire situation everyone faced. 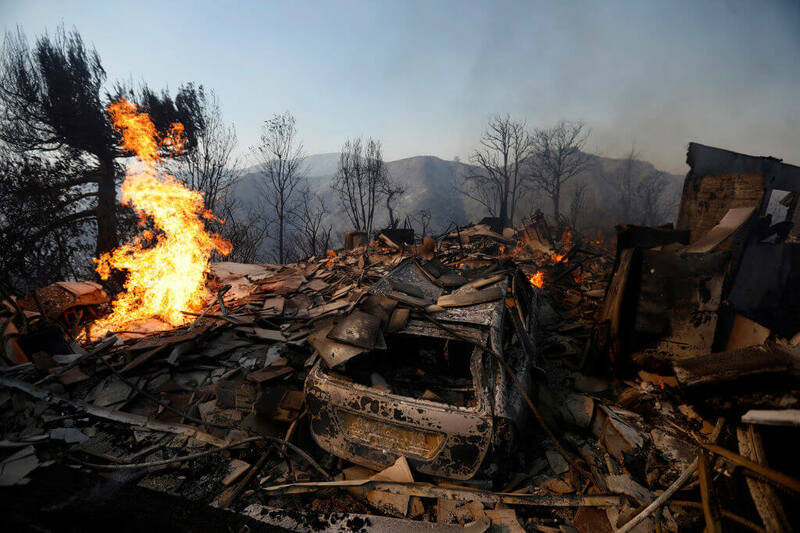 The heavily populated Southern California region is a place where residents heavily outweighed responders, and with fires moving quickly and unpredictably, there was a lot of chaos as people tried to travel to safety. Traffic jams on the highways only made the situation more stressful to people who didn’t know if they would have a home to return to. This fire soon threatened the Bel Air neighborhood.